There are a great many spreads available- perhaps even more spreads than there are readers! The right spread can assist in clarifying a question and providing insight, just as the wrong spread can confuse the issue and cloud the answer. In some cases a reader can customize a spread to fit the question or personality of the querent. The question can also aid in determining what type of spread will be most effective- what does the querent want to know from the reading? I developed this spread to help answer questions relating to the direction of life and decision making- what factors contribute to thought patterns in the present, as well as what factors on an emotional and tangible level. The design of this spread was inspired in part by the Present spread from Anna Cortez, and also incorporates Hecate, the Greek patroness of witches. She is often portrayed with three faces, or three forms- a young woman, the maiden, a mature woman, the mother, and finally an old wise woman, the crone. These three aspects also represent various phases of life, or various phases of development, from potential to actuality to consequence, and this is in part what the spread is meant to convey. This spread is useful for decision making or examining a life path- where things are going, and what factors contribute to where the querent currently finds his or herself. In this spread, there are three vertical columns, and three horizontal rows. (We'll leave the first card for now). 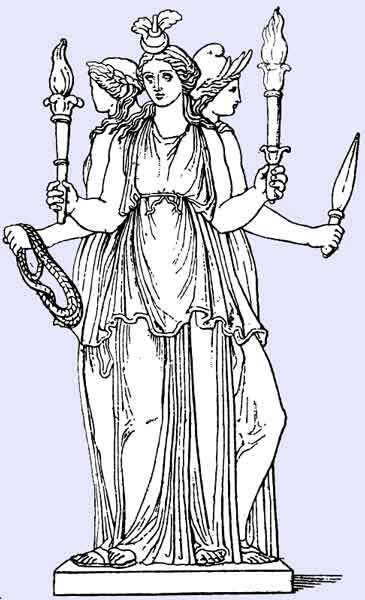 The vertical columns represent the three aspects of Hecate- the left hand column represents the Maiden aspect, the middle column represents the Mother aspect, and the right- hand column represents the Crone aspect. The three horizontal rows indicate three levels on which the querent interacts with the world around them- the top level represents cognitive factors, the middle represents emotional and spiritual factors, and the lower level represents physical aspects- assets, stepping stones or stumbling blocks. I gave each position a name to indicate its position in time and level of influence. 1. The Torch- this position represents the overall influence and direction the querent has taken so far, and represents the path of life this person has chosen. This position can also provide the overall theme of the reading. 2. The Maiden's Eye- in this position, we're dealing with the past, things that have occurred already, yet nonetheless can continue to influence the present. Here are past experiences and memories. 3. The Maiden's Heart- here are emotional memories, as well as guidance provided in the past that has led up to the present- think of this position as where the querent's heart and emotions, as well as higher intuition, have led them. Here also we may see subconscious factors, or something in the past that the querent has overlooked, but nonetheless does influence the situation. 4. The Maiden's Foot- this is any obstacles, tangible factors (employment, finances and similar) and opportunities that have led the querent to the current situation in material terms. Financial hardships, job opportunities they have taken as well as troubles will appear here. When interpreting these first 4 cards, the key is to understand where the querent is coming from- the Maiden represents a malleable, shapeable aspect of the querent, and what factors have shaped who they are today. These experiences and beliefs will likewise guide and shape who they become in the present- and by extension, where the future will lead them. 5. The Mother's Eye- This position tells of the querent's current outlook and viewpoint on their current situation. Positive or negative, this also can influence what decisions the querent makes. An important factor to keep in mind here is what the querent sees and likewise, overlooks. 6. The Mother's Heart- here again are emotional factors in the present, and spiritual guidance the querent finds. Here also are subconscious influences, things the querent may not be readily aware of, or again, overlooked. Here are the subtle nudges that guide the querent, for better or worse. 7. 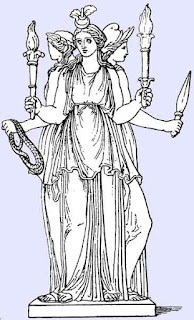 The Mother's Foot- Again, in this position we find current tangible influences- whereas the previous position dealt with hopes and fears, this position deals with physical factors- decisions the querent makes, as well as opportunities and goals at the present time. With the middle three positions, the goal here is to provide a current viewpoint of the situation; mental, emotional and physical. This can be influenced by what has come before, as experience can contribute to current understanding, as well as the querent's current outlook. 8- The Crone's Eye- Here is the outlook of the querent, what they expect to see. Here also are desired outcomes and expectations about the future. This likewise is based on the current situation and past experiences, which create in turn expectations. 9. The Crone's Heart- here are factors involving hopes and fears for the future. What the querent hopes and fears for the future may be represented here, as well as where the Divine may be guiding a given individual in the longer term. Look here for clues to where the querent is being led, or what decisions they make regarding their future. 10. The Crone's Foot- Here we find the final, physical manifestation of the querent's decisions and path of life. This position can also indicate the jumping-off point, so to speak, for the next stage of the querent's life. When interpreting this last column, the key is understanding both how the querent has been influenced by the past and present, and using these factors to determine probable outcomes. As the Crone is a figure of wisdom coming from experience, think of this as a kind of hindsight without the hind. The three right hand cards are meant to determine likely outcomes from what's going on at present. If the querent wishes to change this outcome, the factors to do this can appear both in their own thoughts and actions at present. Overall, this spread is meant to determine longer-term influences on a person, and how those influences manifest, and have manifested already. Remember, the ability to change your path is always within you, and the key to initiating change is understanding.